Maple Syrup Time is Coming! Maple syrup time is right around the corner! 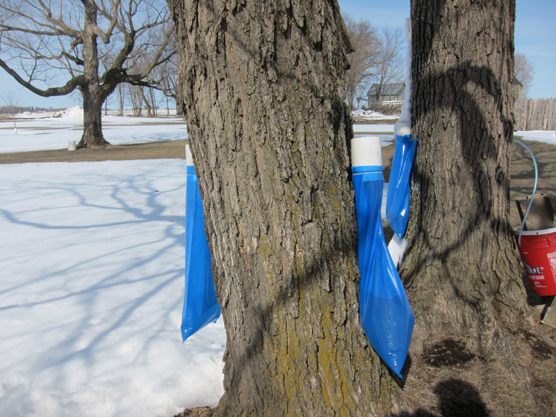 The sap sometimes flows as early as late January or as late as May, but in Minnesota, the sap normally flows from mid-March to mid-April. On a good year, each tap can produce between 5 and 10 gallons of sap, or approximately one quart of finished syrup. Maple sap runs the best when daytime temperatures are in the high 30's and 40's, with night time temperatures dipping down below freezing. It can be quite a process to boil down the sap, usually 30-40 gallons of maple sap to produce one gallon of pure maple syrup. 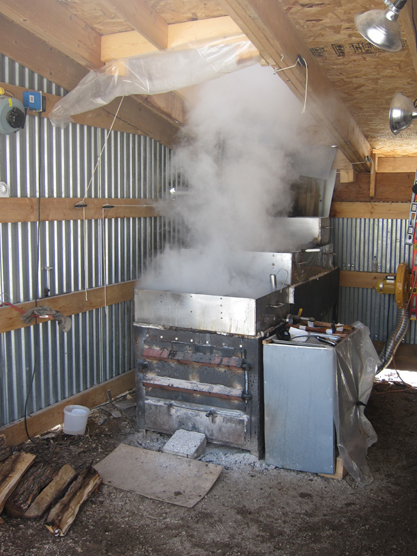 The water is boiled out of the sap on the wood fired evaporator, leaving behind the sugars and distinctive maple flavors. Making Maple syrup is a great family project, whether it is hauling the buckets of sap out of the woods, tending the evaporator, or just savoring this wonderful natural treat. Last spring, we had a tremendous sap flow. We hauled approximately 2,700 gallons of sap out of the woods and ended up with 90 gallons of finished syrup! Tom and I enjoy helping our hobby farm buyers find just the right property of their dreams. Whether they have interest in horses, livestock, gardening, maple syrup or even honey bees, we are knowledgeable about all aspects of country living. Give us a call to discuss your needs for your new property!